Habanero peppers are one of the spiciest pepper varieties on earth. 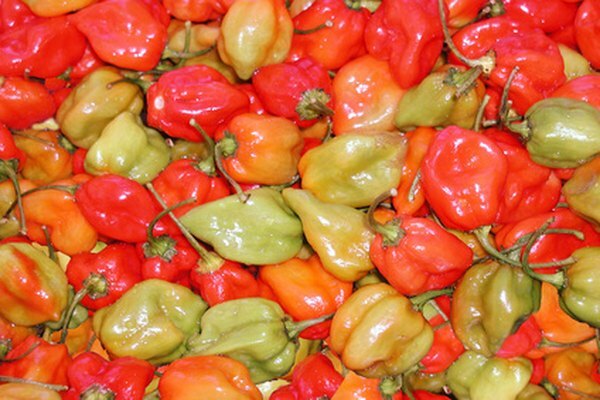 The habanero species is characterized by small peppers that are most often orange, but can also be white, pink or red. Mexican, Spanish and Latin cuisines incorporate habanero peppers into many of their dishes, and people who eat them reap multiple health benefits as a result. Adding habanero peppers to your diet may offer you these advantages as well. Oranges, grapefruits and other members of the citrus family are often given the credit for being the best sources of vitamin C. Jack E. Staub and Ellen Buchert report in their book, "75 Exciting Vegetables for Your Garden," that a habanero pepper can have as much as six times the amount of vitamin C found in an orange. The unripe green habanero peppers contain the highest concentration of vitamin C. Getting enough vitamin C in your diet will keep your immune system healthy, promote healthy teeth and gums, and aid in muscle maintenance. You may be hesitant to eat spicy peppers if you have digestive problems because you may feel that the hot taste will upset your stomach further. Staub and Buchert note that the opposite is actually true. Eating hot peppers supports a healthy digestive system because the compounds they contain work to soothe your stomach. Habanero peppers also encourage proper digestion, which reduces instances of gas and constipation. One of the compounds in habanero peppers is called capsaicin, and it is one of the best reasons to add hot peppers to your diet. Capsaicin is linked to many positive health benefits. Weldon Burge reports in his book, "Grow the Best Peppers," that capsaicin may reduce your risk of blood clots, which also protects your heart. Eating habanero peppers may reduce the fat levels in your blood so your body is able to flush more of it away. Capsaicin is also antibacterial so your body is able to fight off bacteria that lead to infection, and it may have anticancer properties as well. Many illnesses can cause a stuffy nose, plugged sinuses or trouble breathing. Habanero peppers have been linked to a reduction in symptoms, reports Phyllis A. Balch in her book, "Prescription for Dietary Wellness." Adding habanero peppers to your diet when you have respiratory problems may clear your sinuses, act as a decongestant and help you expel mucus out of your body. Habanero peppers may also help treat bronchitis and asthma, as well as help soothe the lining of your lungs.